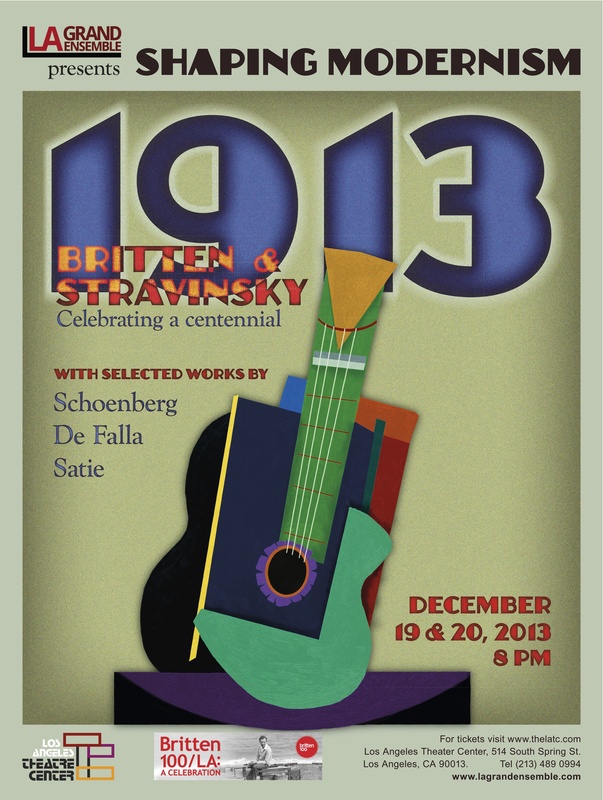 “1913: Shaping Modernism” is the newest production from the LA Grand Ensemble. The year was a deﬁning moment in both music and art. It witnessed the controversial premiere of Stravinsky’s “Rite of Spring,” along with other emblematic pieces like Falla’s “La Vida Breve.” It was during this time so many of our modern tendencies began to take shape. The year not only gave birth to the beginnings of the modern era of expression, but also, most happily and literally, to the indeﬁnable composer, Benjamin Britten. Born November 22, 1913, Britten was one of the great twentieth century composers. For this reason, we are very proud that LA Grand Ensemble is included as part of the LA Opera’s Britten/100 Celebration. To commemorate this milestone, the LA Grand Ensemble has created “Shaping Modernism” speciﬁcally for this occasion. The production will include pieces by Britten, Schöenberg, Satie and original adaptations of Falla’s and Stravinsky’s works, with special collaborations by choreographer Lorin Johnson, dancer Heather Glabe and wardrobe stylist Angela Aaron, as well as set design, video projections and lighting design by our own Creative Team.